Long holiday weekends are great for camping because it doesn’t cost a fortune and it gives you a much needed break from your daily work routine. Since there are so many campsites across the United States, picking the right spot, and knowing what to bring can sometimes be overwhelming. So to make your holiday weekend camping trip more enjoyable, here are some tips that can help you prepare for a great time. Avoid picking a location that’s too far away. Spending most of your time traveling will mean less time enjoying your camping experience. Since most holiday weekend camping trips often begin on a Friday after work and end Monday evening, it makes sense to find a location that only takes a few hours to reach by car. Look for National or State Parks that are within a 100-200 mile radius from your home. This equates to about a 2-3 hour drive, leaving you plenty of time to get there, unpack and enjoy doing other things than driving. Use word of mouth. If you have friends who camp or know some avid campers, ask them for suggestions. Word of mouth is one of the best resources to finding a great camp spot. Don’t go full “survival” on your first trip. First time campers should consider sites that have more conveniences available, such as showers, toilets, running water and a general store that’s within walking distance of your site. This makes it less stressful for first-time campers who go through withdrawals without their hair dryer or a warm shower in the evening. Go primitive to avoid the crowds. More experienced campers who want to stay away from crowds and be more in the middle of nature, should look for primitive campsites. These are usually away from close-quarter sites and offer more quiet and serenity, at the sacrifice of bringing your own water. Most primitive sites may have toilets but no showers. Use a tent that you’re familiar with. 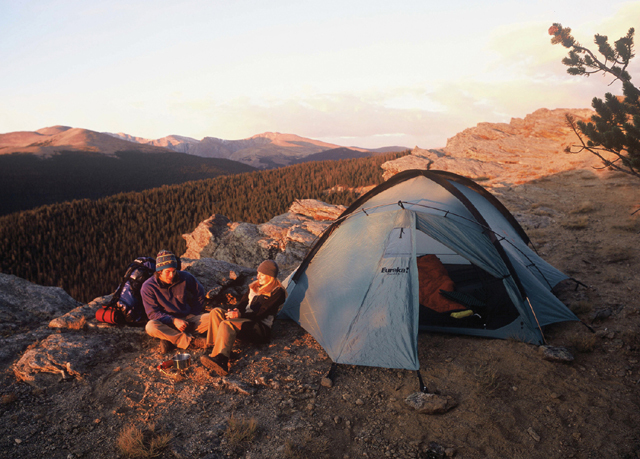 Many first-time campers go out and buy a tent, yet don’t bother to try setting it up until they get to their location. Take the time to practice setting up the tent ahead of time, you’ll avoid lots of frustration. Bring plenty of water. If you’re staying at a primitive site, you can bring several 5-gallon jugs of tap water for washing, cleaning dishes, etc. Keep your drinking water separate and/or use water purification methods to use nearby water sources in case you don’t have enough space to bring enough with you. Make a food list. Carefully plan out what you are going to eat each day you will be camping. On a typical long holiday weekend, plan for a Friday evening dinner. For Saturday and Sunday, you’ll need three meals and perhaps only two on your final day. Don’t forget trail mix and snacks for hiking or other activities including campfires where Smores are the staple evening snack. Don’t forget the obvious. Almost every time we go camping, there’s always something we forgot. Obviously you’ll need a propane stove, pots, pans and dishes. Consider the environment and use plastic dishes and cups that can be washed with biodegradable soap. This prevents paper plates, plastic bottles and cups from overfilling garbage cans and ending up blowing around all over the area. Look over your meal list and consider what utensils or cooking tools you’ll also need to bring. Make a place to sit. Many campsites don’t have benches or picnic tables anymore. Bring folding chairs so you can sit, relax and be comfortable. Bring wood and a way to start a campfire. Most sites don’t allow you to cut down the deciduous trees in the area. So bring enough wood to last you several hours each evening. Use only the provided fire rings and gather tinder or use fire starter sticks to start the fire with matches. Keep in mind that you should never burn your trash in the fire. Bring a small shovel to help completely put out the fire in the pit. Always bring a first aid kit. This should be an essential part of your camping trip. You never know what accidents may happen and having a first aid kit handy is key to treating the smallest mosquito bites to more serious injuries. Study up on your destination. Knowledge of where you are going is key to having a great camping experience. Go on-line and find out where the hiking trails are located and which ones are best for your level of experience. Check the weather before your trip to find out if you’ll need jackets for rain and cold, or hats and sunscreen for intense heat. By following some of these suggestions, you’ll be ready and organized enough to simply enjoy the outdoors and get the most our of your camping trip.